Fortunately, website development is no longer the domain of just techy-types. With the benefits of content management systems (CMS) such as WordPress, even the most technically challenged business owners can create and manage their own websites. Wait a second, you may be asking. Isn’t WordPress just for bloggers? The answer is a resounding NO. 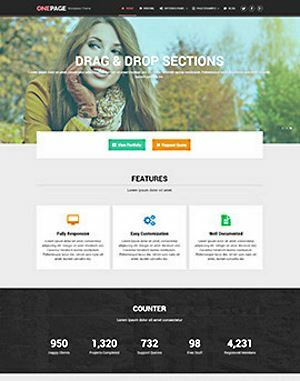 These days, smart business owners are launching fully functional websites using the WordPress “One-Page Business Theme” from MyThemeShop.com, creative one-page website solution that offers a full range of features designed specifically to get your business built, optimized, and found on the Internet. While there are thousands of WordPress themes out there to choose from, the “One-Page Business Theme” is specifically designed to enable your business to top the Google rankings in your local area. It has been fully SEO optimized to help give your website the placement it needs on Google, along with other search engines like Yahoo!, Ask.com, and Bing. Did you know that technology and business experts are predicting that there will be more consumers accessing the Internet via mobile devices than PCs within the next three years? To stay competitive, businesses need to have a website that can be viewed on smart phones, tablets, and iPads. The “One-Page Business Theme” has this trend covered so that you can stay one step ahead of your competition. You’ll be able to create touch-enabled mobile web pages, making it simple for anyone on the go to be able to find your business and call you. The innovation of the “One-Page Business Theme” is truly robust. You’ll also be able to create customized Facebook landing pages and manage content on these pages from the same “dashboard” that you manage your website content. And, with a built-in blog, you can also provide your customers with fresh content to further engage customers and increase your ability to be found online. Yes, the “One-Page Business Theme” can help you build a website. But, it delivers much, much more and at a price that is dramatically less than what you would pay for a standard HTML site. By offering mobile capabilities and incorporating SEO and social media, you have a simplified, yet powerful solution for launching your business successfully from the start. Sound interesting? It truly is! Smart business owners across the country are choosing the “One-Page Business Theme” not because it’s just cost-effective, but because it delivers exactly what is needed for successful online marketing. Get a Copy of the “One-Page Business Theme” Today! If you’re ready to launch your business website, click here to download the “One-Page Business Theme” today!